It’s going to be a busy and exciting summer for Budd Bay Promotions and Apparel. They’ll be an active sponsor for several local events, starting with the upcoming Lacey Spring Fun Fair May 19-20 at Saint Martin’s University. 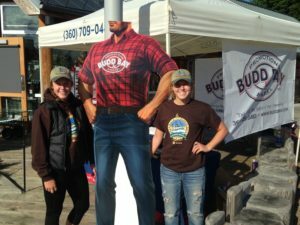 This is their first year at the Lacey Spring Fun Fair, but Budd Bay has been involved with many community festivals in previous years. A family business run by John Grantham, Budd Bay strives to be as involved and supportive as they can in the local community. John has been an owner of Budd Bay for 20 years. During that time, he and his wife have grown their business and gotten to know many different people in the community. “We work with so many different customers,” John says. “We don’t have a single customer that accounts for more than five percent of our business.” From city and state agencies, school districts, to small independent businesses, the Budd Bay reach is far and wide. What started as an embroidery shop has evolved into a full service promotional product agency, including graphic design services and on-line stores, allowing customers to get help with logo design and other projects. The Budd Bay business has grown too, in part thanks to the energetic new sales team, John notes. While about half of company sales are from clothing and apparel, the rest is from a large variety of promotional products. “We have a keychain that looks like a bottle cap that is actually a bottle opener,” shares Kristin. Mugs, tote-bags, and other cool gadgets like their popular cell phone fan attachments can be found in their online store. 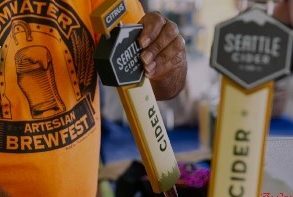 Customers can pre-order online up to a month before their other big event, Tumwater Artesian BrewFest on August 18, as well as before Olympia Harbor Days on Labor-Day Weekend. Their gear is customized to each event, with tee shirts, hoodies, hats, and other give-away items to commemorate the day’s festival. Merchandise sells out fast at these events, so pre-orders can guarantee you will get what you want and in the right size. 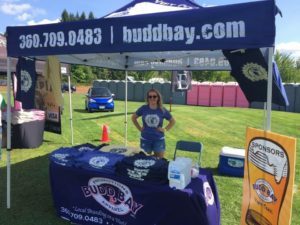 Budd Bay Promotions and Apparel is also sponsoring two fundraising festivals, Lacey South Sound Chamber’s upcoming South Sound BBQ Fest on July 8, as well as Gateway Rotary’s Brats Brews and Bands on September 15. 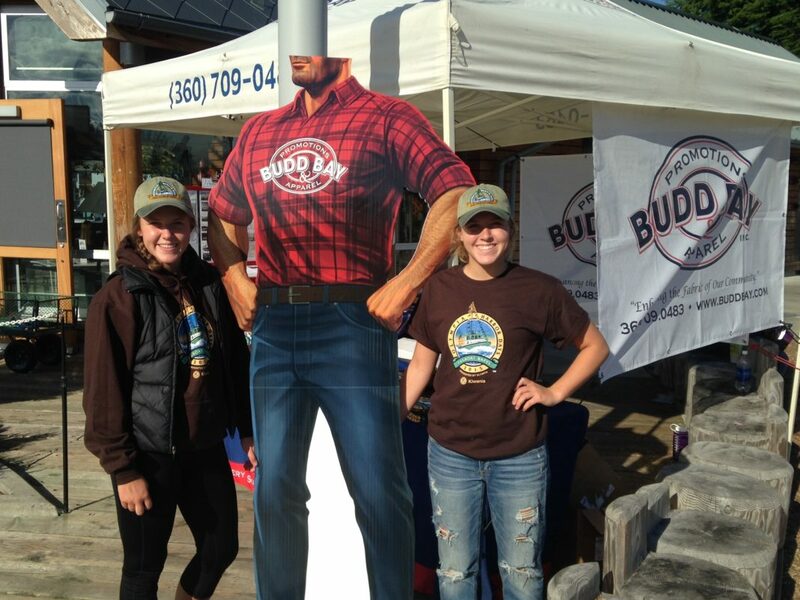 Meet the friendly faces behind Budd Bay Apparel and Promotions at their event table and pick up some handy sunglasses, hats, and other merchandise. Thanks to their sponsorship and support, these summer events are sure to be a fantastic way for families and businesses in the community to celebrate the summer together.